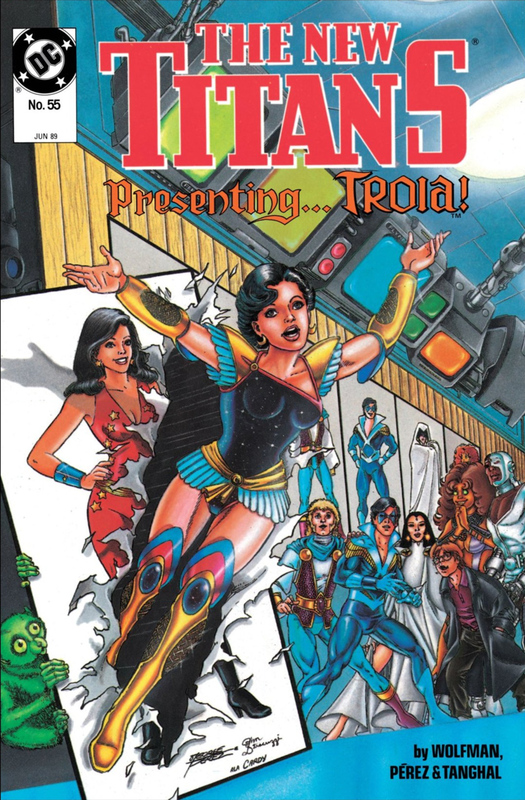 Donna Troy has had one of the most interesting -- and often confusing -- histories of any character in comics. But her optimism and strength have kept her a fan favorite for over fifty years now, culminating with her first appearance in live-action in this week's episode of DC Universe's Titans (watch episode 8, "Donna Troy", on Friday, November 30th here). Yet Donna's entire existence is owed to an editorial mistake! A version of Wonder Girl first appeared in Wonder Woman #105, back in 1958. This teenaged version of Princess Diana was an attempt to replicate the success of Superboy. Not many years later, the adult Wonder Woman, Wonder Girl, and even a Wonder Tot had many adventures together in stories that were labeled "Impossible Tales." These were explained to be movies made by Wonder Woman's mother, Queen Hippolyta, who would splice together films of herself and Diana at different ages. The average reader probably believed Wonder Girl was an all-together different character than Wonder Woman, the Robin to her Batman. One of those people was writer Bob Haney. When putting together the original line-up for the Teen Titans, he added Wonder Girl as a charter member, not realizing that, technically, she was supposed to be the same person as Diana. 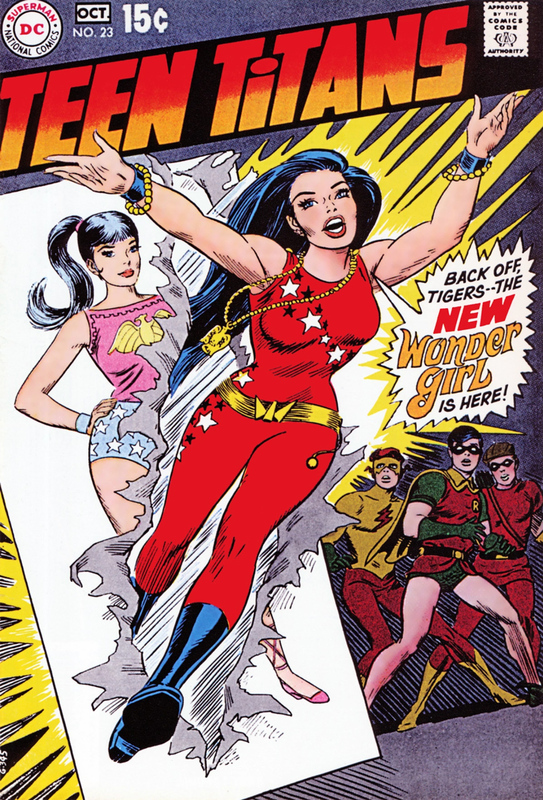 First appearing in 1965, the Titans' Wonder Girl was portrayed as a contemporary teenager who loved the era's rock n' roll and go-go dancing. But she was never referred to by any name other than "Wonder Girl," or her nicknames "Wonder Chick" or "WG." Then in 1968, DC hit a snag. As part of a massive overhaul to Wonder Woman, Diana lost her special abilities and became a non-costumed super spy. Her Amazon sisters left Earth for another dimension, leaving Diana without a connection to the magic which gave her super powers. So how could Wonder Girl still exist in the pages of Teen Titans? Enter a young writer named Marv Wolfman, who gave Wonder Girl a proper origin at last. In 1969's Teen Titans #22, he explained that Wonder Girl was actually not a real Amazon, but came from America. As an infant, she was rescued from a burning building by Wonder Woman, and when it turned out she had no living relatives, Diana took her to Paradise Island, where she was raised by her mother Queen Hippolyta. She was given a portion of each Amazon's power, resulting in her having super strength. She also finally had a real name -- Donna Troy. This same issue, she debuted her new costume, a variation of which she would wear for the next twenty years. The costume made its cover debut with the following issue, Teen Titans #23. When The New Teen Titans was launched in 1980, Wonder Girl was front and center. The now older teenager was a professional photographer, and was also in a relationship with a divorced college professor named Terry Long. 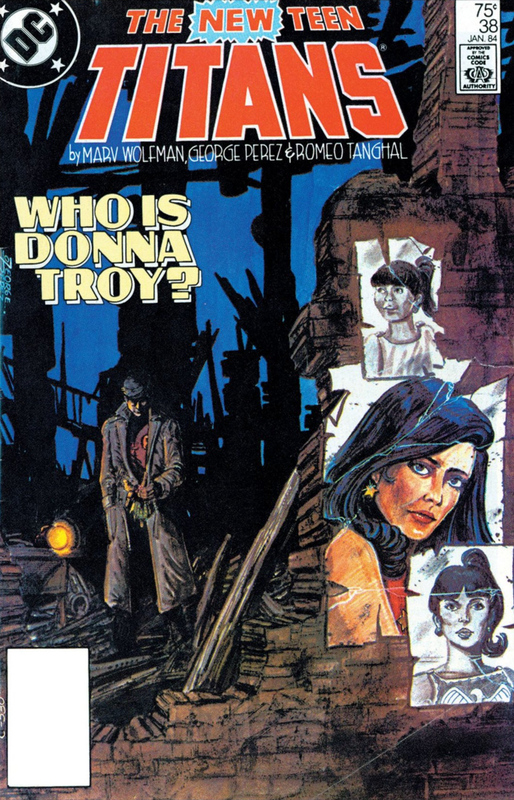 During these years, Donna would discover who her birth family really was, in the classic story "Who Is Donna Troy?" (The New Teen Titans #38), and would marry Terry Long, in a wedding ceremony (in Tales of the Teen Titans #50) that went off without a hitch; a rarity in the days when super-villains crashed every wedding. It was after 1984-1985's Crisis on Infinite Earths that things got weird and confusing for poor Donna. As a result of this epic's reality-altering events, Wonder Woman was wiped from history. Then a new version of Princess Diana entered the DC Universe as an entirely new hero in the present. This created a conundrum for Donna. Who rescued her from the fire? Why does she have a name and costume which resemble Wonder Woman's? Does that mean the DCU had a Wonder Girl before a Wonder Woman? Titans creators Marv Wolfman and George Perez tried to address these issues in their 1988 story "Who Is Wonder Girl?" (in The New Titans #50), which explained that Donna was now rescued as a baby by the Titans of ancient Greek myth, who had rescued children from all over the universe who would have died otherwise. Taken to the mythical dimension New Cronus, these children were given powers and returned to their home worlds with no memories as teenagers. When they became adults, they would take their place among the Titans of Myth. 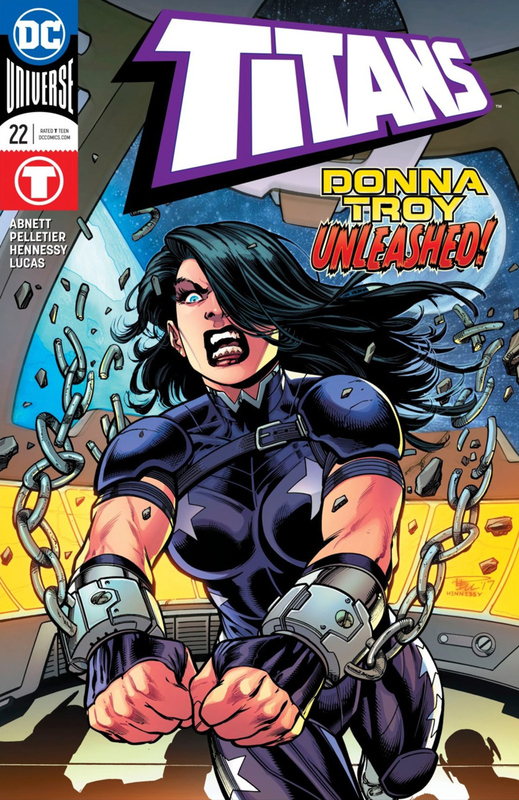 Donna was given new powers, a new costume, and took on a new codename – Troia. Unfortunately, Donna had a very rough go of it in the '90s. Terry divorced her, and their child, a boy named Robert, inherited her god-like powers, and became the mad god known as Lord Chaos, who ruled the future as a tyrannical despot. To avoid that future, Donna asked the Titans of Myth to remove her powers, so her son would be born a normal child. But that didn't save her infant son and his father Terry from later being killed in a car crash. Now powerless and devastated, Donna, for a time, joined the intergalactic heroes called the Darkstars, who gave her a powerful armor which mimicked her super strength. In 1998, writer/artist John Byrne decided to tie Donna back into the Wonder Woman family. He explained that in Wonder Woman's youth, she was terribly lonely, as the only child on Themyscira. An Amazon witch named Magala took a portion of Diana's soul to make an exact duplicate as a playmate. But when the evil witch Dark Angel, an enemy of Queen Hippolyta, came to the island looking for revenge, she kidnapped the doppelganger and subjected her to life after life, each of which ended in misery, before starting over and sending her down a different dark path. Donna's most recent life ended in the tragedy of her family's death, but the Titans of Myth had recognized her unique Amazon spark. And her origin as a fragment of Diana's soul explained why she chose a similar costume and weapons to Wonder Woman, without ever having met her. When Dark Angel was defeated, Donna gained her original Amazon powers again, and was officially adopted as Hippolyta's daughter and Diana's sister, earning a new costume. She rejoined the Titans at this juncture as well. Sadly, Donna was killed by a rogue Superman robot, leading to the Titans breaking up. It was later revealed she was brought back to life by the Titans of Myth, but given the false memory that she was the wife of Coeus, and the goddess of the moon. She discovered that she was a merger of every alternate version of Donna Troy there ever was. When she regained her memories, she also became the repository of knowledge of every version of the Multiverse. When Wonder Woman decided to take some time away from superheroics, Donna picked up her mantle and became Wonder Woman for a time. When 2011's Flashpoint event reset the DC universe timeline, resulting in the New 52, Donna's entire past was reimagined. Donna was reintroduced as an Amazon fully formed as an adult from clay, created by a sorcerer, Derinoe, as an attempt to usurp Diana's place as queen of the Amazons. Later, in the "Titans Hunt" storyline, it was revealed that although she was indeed created out of clay to destroy Wonder Woman, the Amazons later gave Donna false memories of being an orphan rescued by Wonder Woman so she would have a more normal life. Donna is currently a member of the Titans, and while her past might be more complicated than any other hero in the entire DC Universe, she still stands tall as one of its most beloved icons. 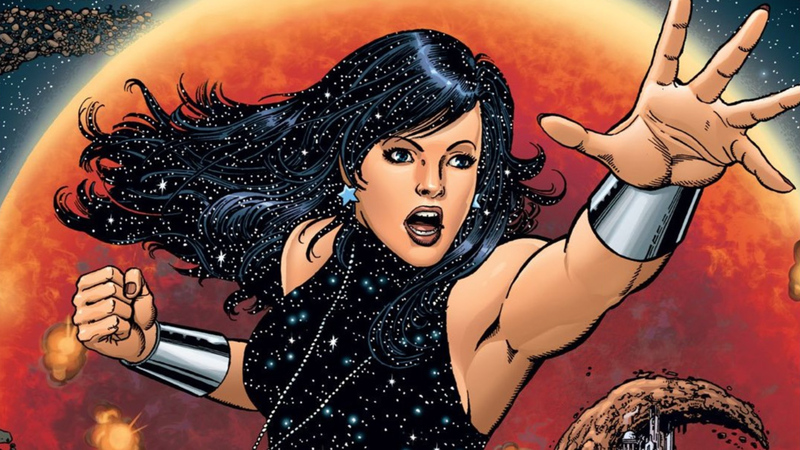 Are you a Donna Troy fan? Let us know in our Community!